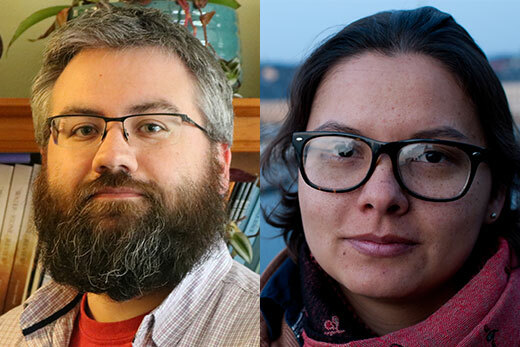 Michael Marberry has been named Emory's new Fellow in Poetry and Cassie Gonzales will serve as the Fellow in Fiction for 2017-2019. The Emory University Creative Writing Program will welcome two new postgraduate fellows to campus this fall. Cassie Gonzales was named the new Fellow in Fiction and Michael Marberry was awarded the Fellowship in Poetry. Both will hold a two-year appointment at Emory from fall 2017 to spring 2019. Originally from Tucson, Arizona, Gonzales earned her master’s degree in creative writing from the University of Oxford and has lived abroad for many years — most recently in Stockholm, Sweden. Her writing has been published by or is forthcoming from “The Kenyon Review,” “Tin House Open Bar,” “The Letters Page,” “Granta Online,” “The Paris Review Online,” “Huizache,” “The Sonora Review” and “The Ploughshares Blog,” among others. Her drama has been staged by the University of Iowa, shortlisted by the BBC World Service and the British Councils’ International Radio Playwriting Competition, and performed on three continents. Marberry is equally excited to join Emory in the fall. “Given the program's excellent reputation in creative writing circles and the high quality of its faculty, it's certainly a humbling opportunity and a real honor,” he says. Originally from rural Tennessee, Marberry is a Pushcart Prize recipient whose poems have been anthologized in “Best of the Net,” “The Southern Poetry Anthology” and “New Poetry from the Midwest” (forthcoming). His poetry has appeared in “New Republic,” “Sycamore Review,” “West Branch,” “Crab Orchard Review” and elsewhere. The coordinator of the nonprofit Poets-in-Print Reading Series, Marberry has previously served on the staffs of publications including “Third Coast,” “The Journal,” “Black Warrior Review” and others. He has earned degrees from Ohio State University, the University of Alabama and Lipscomb University. Recently, he completed his doctorate at Western Michigan University, where his research interests included cine-poetics, comics and horror literature. The Creative Writing Fellows program allows young writers with recent masters or doctoral degrees in creative writing to gain teaching experience, as well as time to finish a manuscript and submit it for publication. They teach three workshops per year. As an instructor, Gonzales looks forward to introducing students to international writers they may not have been exposed to in their previous studies. Both fellows will take advantage of their time on campus to create new work, an opportunity that Marberry does not take lightly. “This fellowship will provide much-needed and hard-to-come-by time to work on new poetry, edit my manuscripts and continue my research, for which I’m deeply grateful," he says. Gonzales and Marberry will give a free joint reading on Tuesday, Feb. 27, 2018, as part of the Creative Writing Program Reading Series. Now in its 26th year, the Emory undergraduate Creative Writing Program allows students to approach the study of literature through their own creative writing, as well as by the more traditional method of critical analysis and reading.